One of the bouncers is called Arreis, the name of "Sierra" reversed. Sierra had just acquired Dynamix at the time. 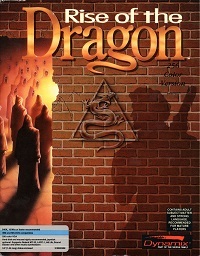 The framed pictures at the top-left of the blackboard in the classroom refer to previous Dynamix games Heart of China, Rise of the Dragon and pre-Sierra Dynamix title F-14 Tomcat (published by Activision in 1988).